The last dated entry in Sergeant Brookes' War Diary is May 2nd 1915. There follows an undated entry recording the 1/7th Warwickshire Battalion training schedule, which is recorded here as a point of interest. Squad Drill, Lecture Trenches Captain Moss. Squad Drill, Extended Order, Lecture Trenches Captain Moss. Physical Drill, Bayonet Fighting, Company Drill, Lecture Trenches Captain Moss. Extended Order, Company Drill, Parts of Rifles, Lecture Pay and Mess by Quartermaster. Sergeant Edward (Ted) Brookes, 1/7th Bn., Royal Warwickshire Regt celebrated his 36th birthday in the trenches on 1st May 1915 and was killed only 10 days later. At home Edward left his wife Florrie Brookes nee’ Beesley and two children: Lillian Aged 10 and Lewis Aged 8. 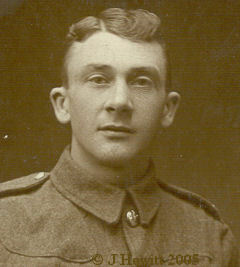 Edward, originally a member of the Old Volunteers, rejoined the Territorials in May 1909. Given orders to seek out the sniper who had been taking pot shots at them Sergeant Brookes set off with a small search party which included his brother in law Jim Beesley (pictured above and right). Unfortunately they searched in vain. As they were returning to camp Jim felt a bullet pass by, he thought 'this is it, I’m a goner'. Then he realised that his brother in law was hit; Edward had been shot in the back. In a letter to his widow Captain Hanson said 'Your husband was a Sergeant in my Company and his death was a great blow to me and to the whole company, with whom he was always very popular. He was shot at about 1am on May 11th while returning from a patrol. He died an hour after, being wounded and was unconscious for some considerable time before he died. Please accept my very deepest sympathy and the sympathy of the whole company in your loss. 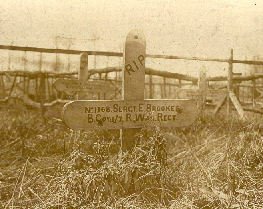 Edward Brookes is buried at La Plus Douve Farm Cemetery Belgium. The extraordinary diaries of Thomas Cairns Livingstone represent twenty years of gorgeously idiosyncratic daily records of a middle-class Glasgow household, over a period spanning shortly before the Great War to the early 1930s. Thomas Cairns Livingstone, a mercantile book keeper, began his diaries in 1913, when he, his wife Agnes and their son ‘wee Tommy’ set up house in the Glasgow neighbourhood of Govanhill. For the next twenty years, Livingstone dutifully recorded each day’s events in his Collins diaries, from small domestic dramas to troop movements as news of the Great War filtered back to the anxious home front. Rescued during a house clearance, the intricate details of these journals – interspersed throughout with Livingstone’s wonderfully warm and idiosyncratic illustrations – provide a priceless record of the impression world events were making on the ordinary people at home and an extraordinary chronicle of the ups and downs of working-class life in the period immediately before, during and after the First World War. The details of the family’s early life, notes about the (usually dreich) Glasgow weather, and comments on the carnage on the front and on the high seas, are written and illustrated with such warmth and charm that the story of this very ordinary household in the early part of the 20th century becomes completely addictive.